"Among the earliest settlers [in this area] was Andrew Montgomery, who established a trading post at the crossroads of the Loma del Toro and lower Coushatta traces. 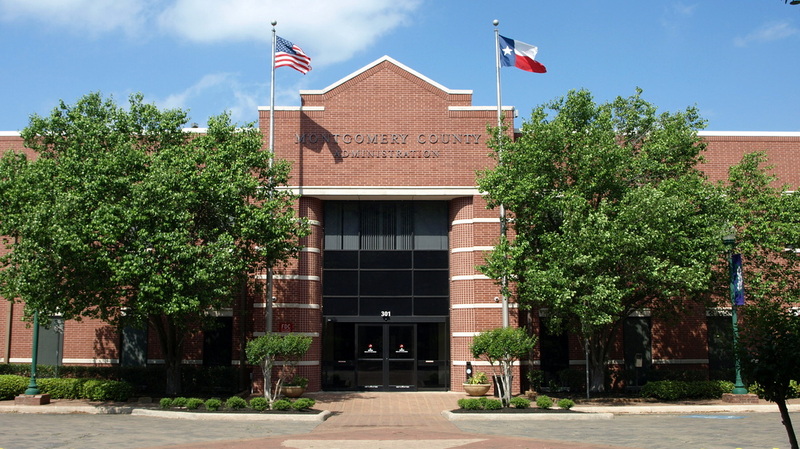 "[In] 1837 the Republic of Texas Congress established Montgomery County, which was named for its largest settlement. The new county was carved from Washington County, and its borders originally extended from the Brazos River on the west to the Trinity on the east, and from the Old San Antonio Road on north to the San Jacinto River on the south, an area which included future Grimes, Walker, San Jacinto, Madison, and Waller counties. The county's present boundaries were established after the establishment of Waller County in 1870. 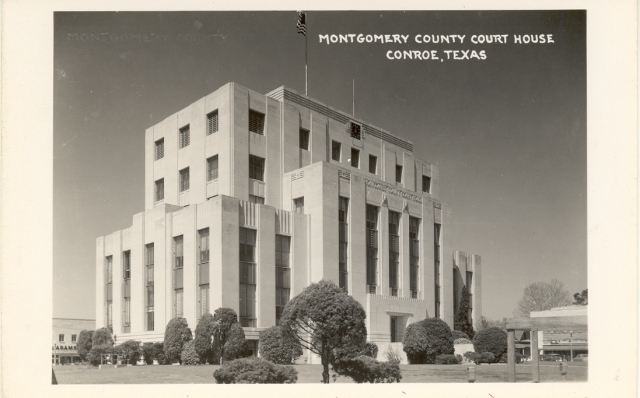 "The town of Montgomery, situated on the stagecoach line that ran from Huntsville to Houston, was made the first county seat ..."
"The construction of ... railroads [in the county] touched off an intense controversy concerning the location of the county seat. The first railroad missed the town of Montgomery. 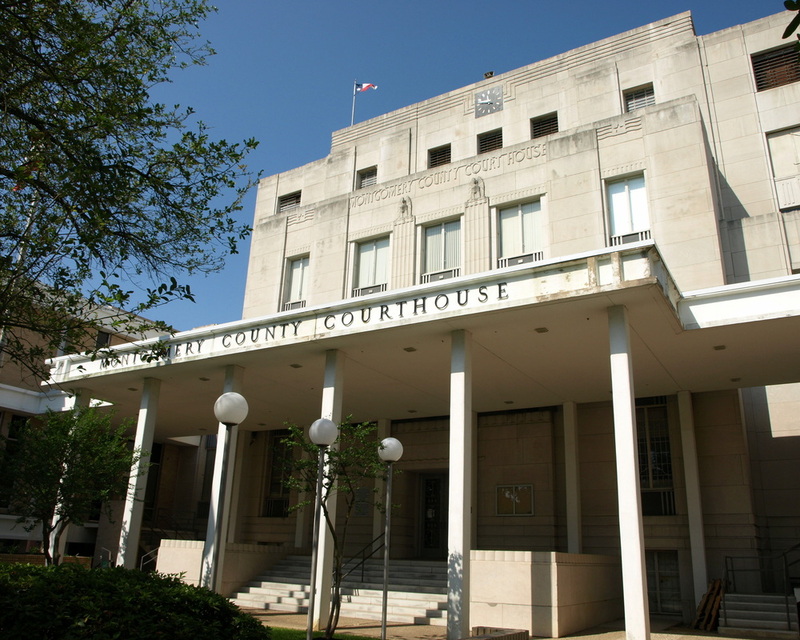 Willis, a new town on the railroad was voted county seat in 1874, but the county seat was moved back to Mont-gomery in 1880, after the Houston and Texas Central was built through. 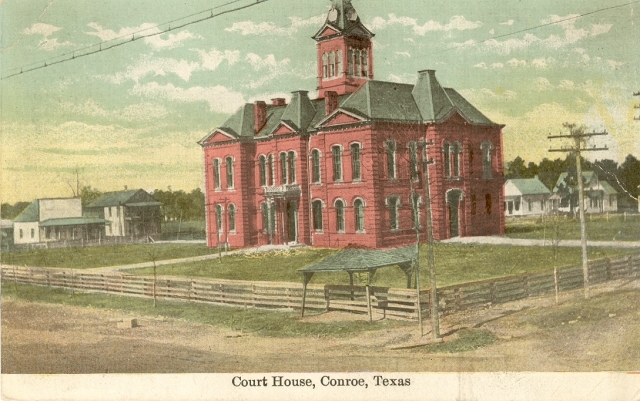 In 1889, however, the county seat was moved to the fledgling community of Conroe, which was situated at the junction of [two railroads]." 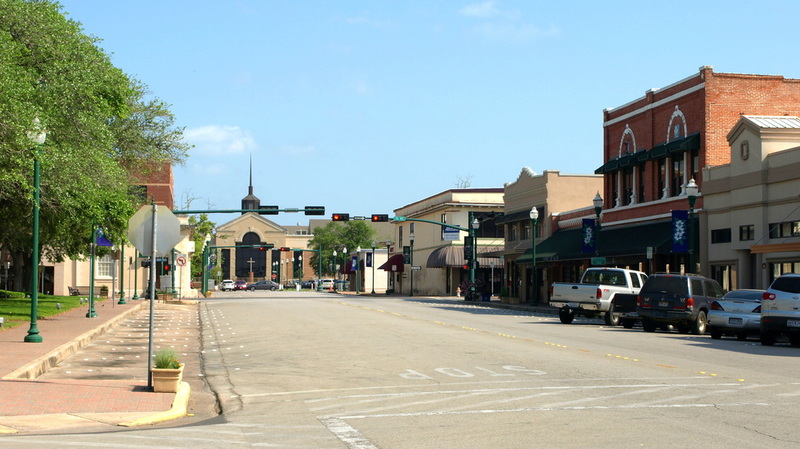 A northern suburb of Houston, Montgomery County is growing rapidly. 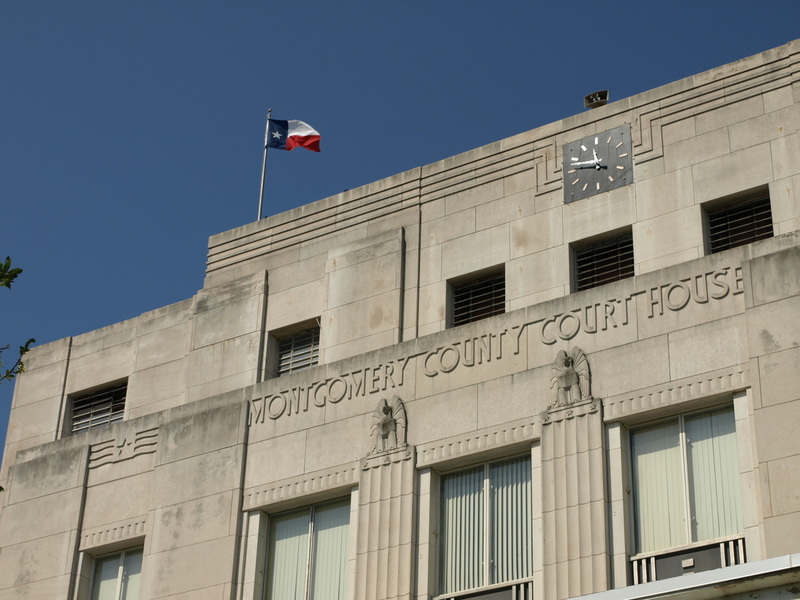 I visited Montgomery County and photographed the courthouse in Conroe on April 10, 2011. 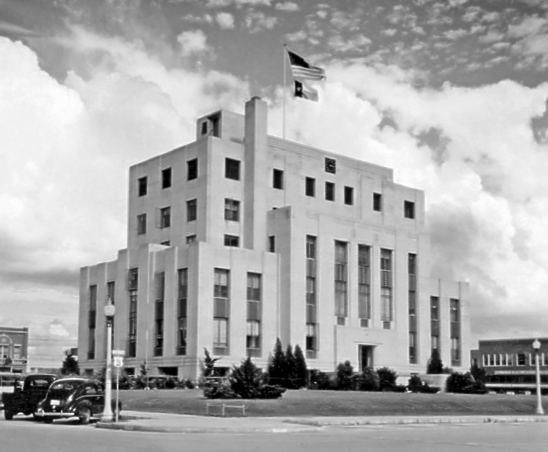 Joseph Finger's 1936 design replaced Heiner's 1891 courthouse. 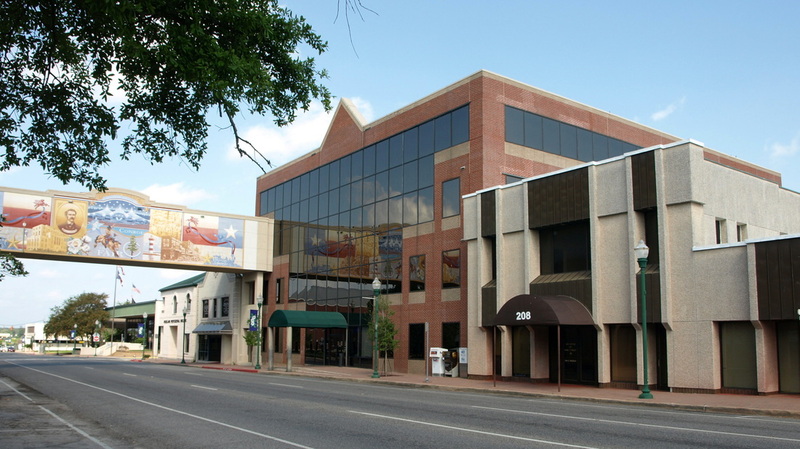 The new, modern art deco style building occupies the center of the square in downtown Conroe. 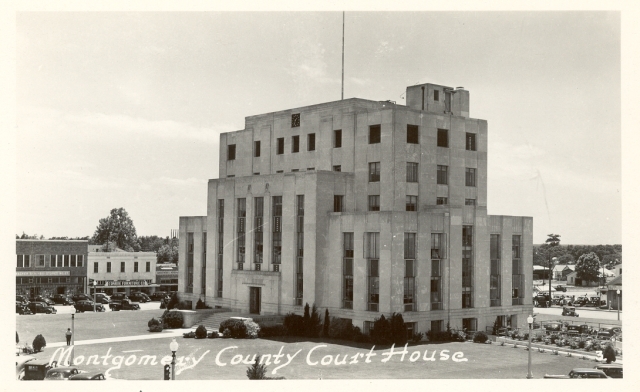 By 1965 the building was too small for the growing county government and additions were added on the north and south. 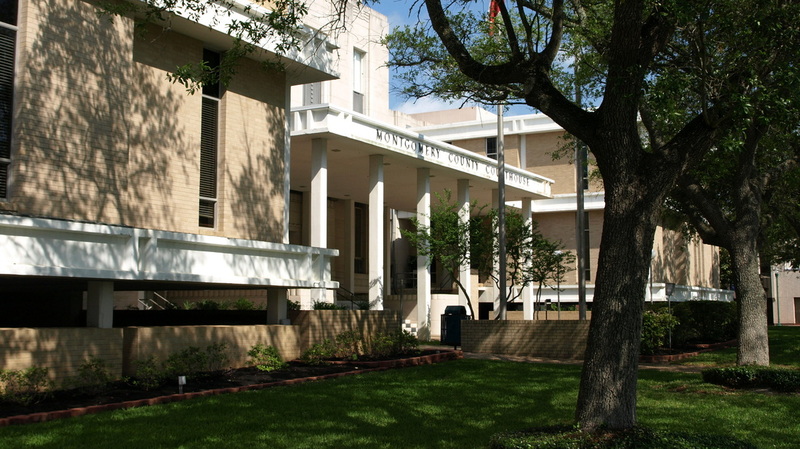 The front of the courthouse faces east, onto N. Main Street. 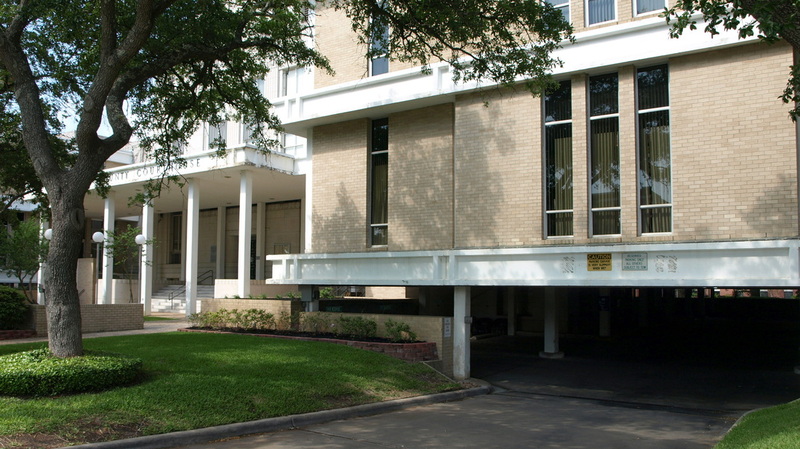 The 1965 additions included porches that partially covered the 1936 facades. N. Main Street, looking north. The courthouse square is on the left. The 1936 facade rises above the 1965 porch. This is the east side of the building. The east facade with the 1965 addition on the north. The north and south additions are elevated to create covered parking below the building. The southeast corner of the courthouse. The 1936 building rises above the 1965 addition. 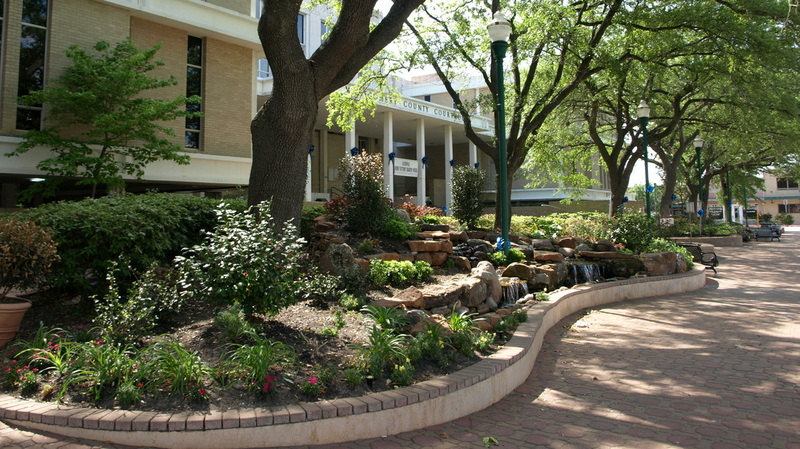 The courthouse square is elaborately landscaped. This is the west facade, facing N. Thompson Street. 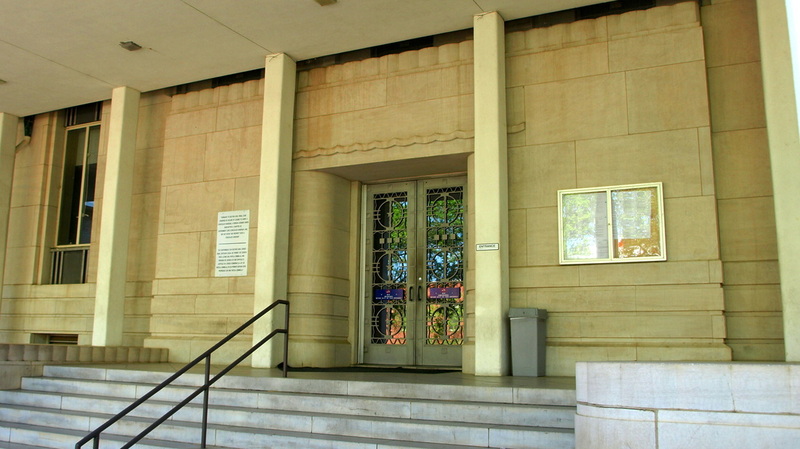 The 1936 west facade and doors. The columns support the 1965 porch addition. 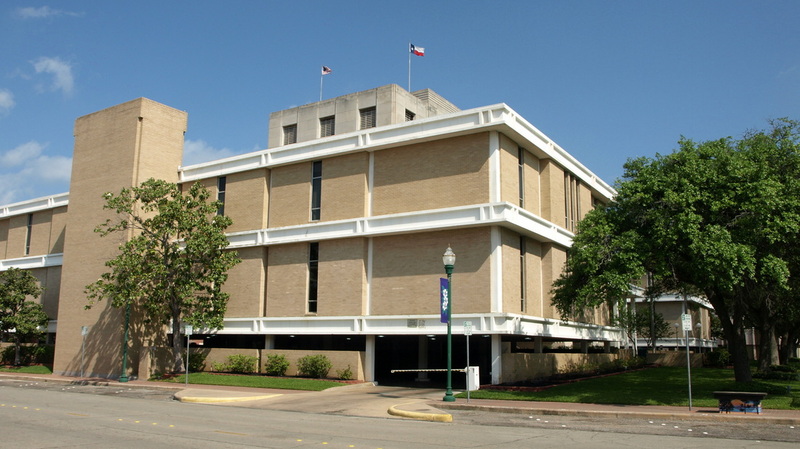 A Montgomery County office building on the north side of the square is connected to the courthouse by an enclosed bridge over W. Davis Street. The courthouse is reflected in the glazed facade of the annex. 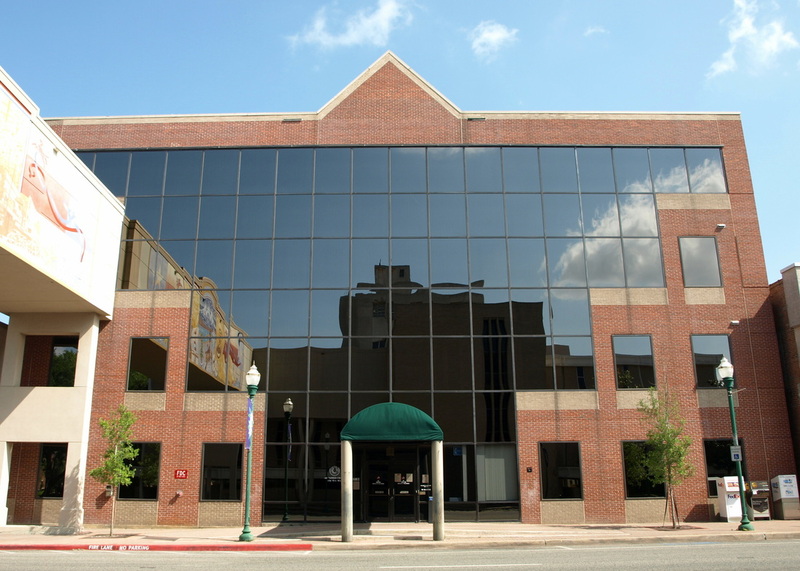 The Montgomery County administration building occupies half a city block directly west of the courthouse, across N. Thompson Street. 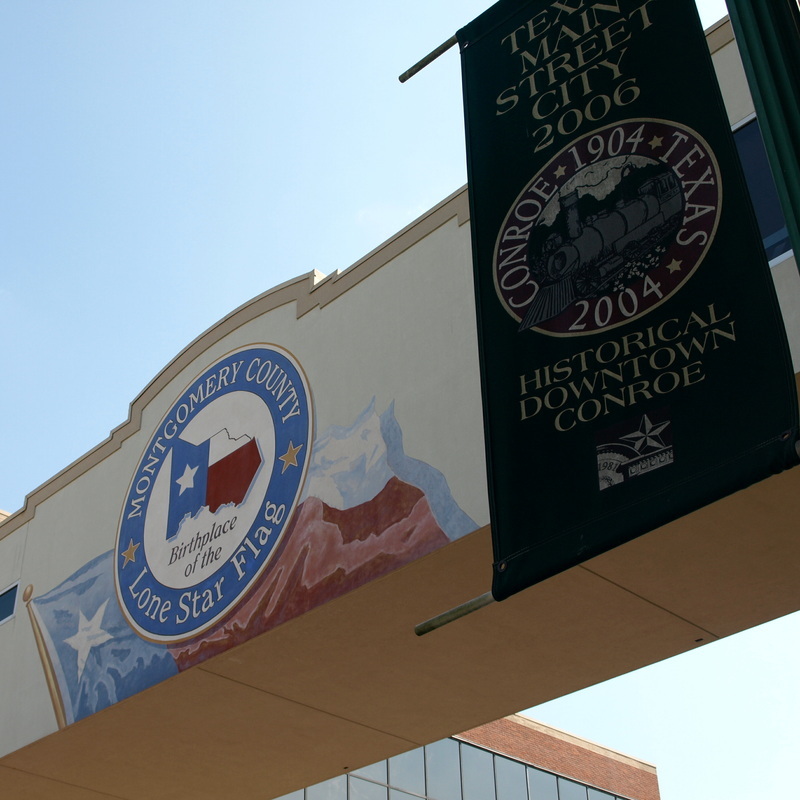 Conroe celebrated its centennial in 2004.